With my many trips to Belgium, I am always impressed with the way beer is incorporated into their cuisine. 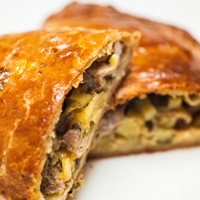 The proximity to France and their elegance with their dishes comes through in the flavors of Belgian Cuisine, while having this rustic hearty German influence from the east. These styles of cooking inspired me to create this dish. 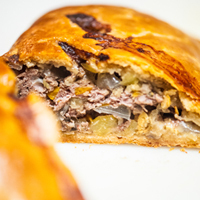 Leeks are under used in the USA and I wanted to highlight them in this recipe, layering their flavor with a malty Dubbel style bière, to give the dish some sophistication and finesse to the finished dish. 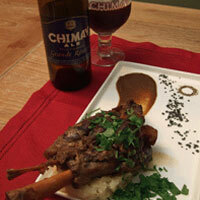 A wonderful Belgian style recipe. 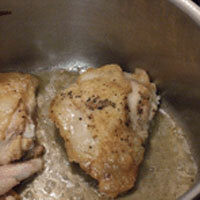 In a large dutch oven, placed over medium high heat, add rendered duck fat or olive oil. 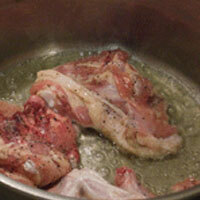 The duck fat adds a richness and increases the smoke point (higher temperature) that cause most oils to burn. Take the cut up chicken, making sure it is dry and season well with salt, pepper and sprinkle evenly with flour, to help form a nice crust and to help thicken the sauce as it cooks. Sauté 4 pieces of the chicken at a time, as not to crowd the chicken and allowing steam to escape. 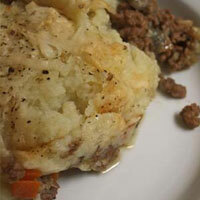 Cook until lightly browned, but not cooked all the way through; about 5 minutes a side. Remove the chicken to a holding plate. Repeat with remaining 4 pieces of chicken and also remove the chicken to the same plate. As the chicken is browning, take the leeks, slice in half and soak in water for 3 - 4 minutes, to help remove any dirt stuck between the leaves. 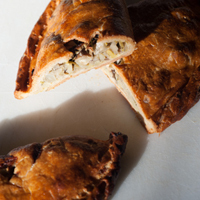 Remove from the water and slice into half rounds about ¼ inch thick. 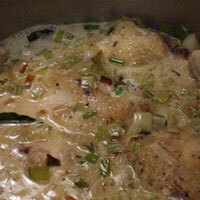 Once the chicken is done browning, add the leeks, bay leaves and thyme leaves to the dutch oven. 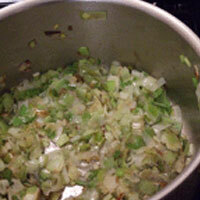 Sauté over medium high heat for 6 minutes or until the leeks have wilted slightly, but not fully cooked. Deglaze the dutch oven with the Dubbel beer, scraping the bottom of the pan with a wooden spoon, to remove any fond that has formed. 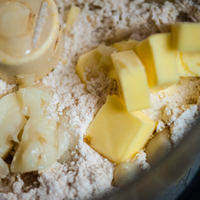 Add the chicken stock and cream and mix. Then return the browned chicken pieces, along with any juices that have collected on the plate and turn heat down to medium. Cook the chicken until tender, about 20 minutes. If the leek sauce is not as thick as you would like, remove the chicken and turn the heat on the dutch oven to medium high and cook for another 2 - 3 minutes. This dish can be served family style or can be plated on a bed of Potato Celery Root Purée, a piece of the chicken and topped the Dubbel leek sauce. 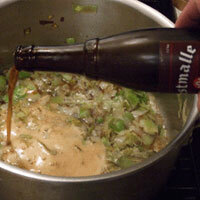 A authentic Trappist Dubbel such as Westmalle Dubbel is perfect for this recipe. It has that wonderful malty complexity, that has elements of dates, figs and a sweet caramel undertone that blends beautifully with the tender leeks and cream. The another Trappist Dubbel like Westvleteren 8 would also work. If you can't find either of these beer in your cellar, you could use a non-trappist version of the style, like Allagash Dubbel. Nice. Uses a St. Bernardus 8.